McGaw Park Neighborhood Transportation Plan & TIA - TADI - Traffic Analysis & Design, INC. McGaw Park Neighborhood Transportation Plan & TIA - TADI - Traffic Analysis & Design, INC.
TADI’s ability to understand their client’s vision and deliver quality services in a timely fashion enabled the comprehensive planning team to successfully create the McGaw Neighborhood and Transportation Plan. 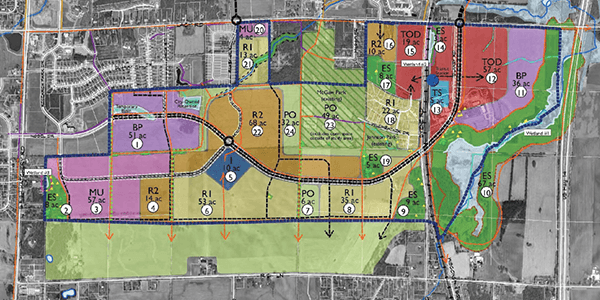 The City of Fitchburg planned a long-term compact/urban development for 712 acres of mostly undeveloped land in southern Fitchburg. The vastness of the area presented many social, economic, and transportation challenges. TADI’s multifaceted traffic engineering team provided the balance of expertise, creativity, and responsiveness necessary to provide transportation solutions. Working hand-in-hand with the City of Fitchburg, Madison Metro, and Dane County MPO, TADI collected data, modeled 25 intersections, attended various public meetings, and developed a long-term transportation vision for the area. This vision included seamlessly incorporating pedestrian, bicycle, and transit accommodations while minimizing potential impacts to the environment. TADI also assisted the City in obtaining LEED Neighborhood Design certification. TADI’s ability to understand their client’s vision and deliver quality services in a timely fashion enabled the comprehensive planning team to successfully create the McGaw Neighborhood and Transportation Plan.